Reviewed by Maria Conway on December 28, 2016 5:32 pm . Nothing is more fulfilling than doing a good deed for society. And what could be nicer than playing bingo while at the same time doing it for a good cause? At Rehab Bingo, you can do both! Launched in 2005, Rehab Bingo is part of the fundraising activity of the Rehab Group. It is one of Ireland’s biggest charities that provide training, employment, social and health care services to individuals with disabilities as well as those who have been socially marginalized. This means that everytime you spend a bit of cash at Rehab Bingo, a portion of it will go straight to the rehab charity to aid the less fortunate. Rehab Bingo guarantees that all of your favourite network rooms and games are accessible and easy to use. The site is powered by Virtue Fusion software which provides a platform of excellence in online bingo gaming. The web design has a cityscape theme, showcasing a pale blue sky with fluffy clouds; giving off an atmosphere of hope and a chance for amazing wins where the sky is literally the limit. The site guarantees quality gaming and easy navigation. The homepage is bright and attractive with everything you need to get around the site easily found in one place. The site also has X Factor sensation Mary Byrne as its muse, so you’re always greeted with a warm welcome. So whatever you’re looking for, you’ll definitely find it here at Rehab Bingo. Great games, prizes, promotions and bonuses are in abundance and bingo fans will undoubtedly have a great time when they join the site. There aren’t many sites out there that can beat Rehab Bingo’s offerings, not to mention its goodwill. So what are you waiting for? Do the right thing and head over to Rehab Bingo. Once you get there, there’s no turning back. You’ll get hooked in an instant! Rehab Bingo has one of the most impressive offers in terms of new player promotions. New players are entitled to a 200% bonus on their initial deposit of at least £10. If you decide to commit to the site and make a second deposit, you’ll be eligible for a bonus of £10 on a deposit of £10 or more. Frequent depositors will also be eligible for a 5% to 10% reload bonus, plus the chance to gain access to the exclusive depositors’ room, with £1,000 in prizes up for grabs every week! As if this wasn’t enough, on Mondays all depositing players can obtain an easy deposit bonus of roughly 10%, which is based on previous week deposits. Not only this, but players are entered into a private bingo game where they can win up to £900 in cash. 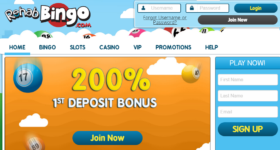 Promotions and bonuses like this certainly add to the experience when playing bingo online. Rehab Bingo doesn’t let you down with their impressive collection of games! Impressive cash prizes are up for grabs, and are clearly displayed before you enter a room. The bingo lobby has tabs for 90-ball, 80-ball and 75-ball bingo and multiplayer games, as well as access to mini-games. You can play bingo for a card price of 5p. The site has plenty of standalone and networked bingo rooms for players to enjoy. One of the most popular standalone rooms is the Mary Byrne room. The room is equipped with bargain bingo and multivariant games to add a bit of spice to your gaming experience. Join the Super Free and Fair for All Bingo every Sunday in Bridget’s 90-ball bingo room. The games are absolutely free, with impressive prizes all yours for the taking. All other games are Fair for All, with a max purchase of 12 cards. There are more bingo specials on offer such as BOGOF, lunchtime specials and the Deal or No Deal bingo. The site has a complete schedule on the daily bingo events, and players are given an option to pre-buy tickets in advance. Rehab Bingo also hosts an exclusive Must Go Jackpot game on Thursdays. The £1,250 Jackpot Got 2 Go has an impressive £880 jackpot to be given away to the Full House winner, and £370 shared amongst other players with at least 6 tickets in the winning game. There are more non-network bingo sessions in store for players, and they can retain the option to play in the standard VF rooms, too. For players who want a bit of variety to their wagering, there’s a list of other games for them to enjoy and win amazing prizes. You’ll find one of the most extensive range of slot games at Rehab Bingo with minimum line bets of 1p, with special features like free spins, wild symbols and bonus rounds. Multiplayer slots allow players to interact while spinning and winning a share of the community jackpot on Multi Balls, Clover Rollover and Marine Mayhem. The site is also home to popular slots such as Big Top Tombola, Dynamite Digger, Clover Rollover and Ladies’ Leisure. The prizes for some of these games have been known to reach well over £1 million, so you can spin and win some life-changing cash! Scratch away and win awesome prizes with Rehab Bingo’s scratch cards. Make sure you check out popular titles such as Golden Balls, Treasure Time Traveller, Big Bounty, Arabian Delights, Deal or No Deal, Beat the Bank and Ladies Night. The casino games complete the entourage of amazing games and they’re excellent for players who are looking for a good time. You can test your wits against the Blackjack dealer or you can try your luck and spin on the Roulette wheel. Whatever tickles your fancy, you’re sure to find them at Rehab Bingo. So why not get in the spirit of charity and hop into Rehab Bingo today? Fruity Burst – Personal favourite. The best thing about Rehab Bingo is their commitment to the Rehab Group. For those who like to do their share for charity, this site will definitely warm their hearts. Rehab Bingo also pays out over £1 million in jackpot prizes every month through special tourneys and competitions. The site is definitely the best place to win big and give to charity at the same time. You’ll definitely get the best of both worlds! If you’re on a tight budget but would still want to earn cash along the way, keep your eyes peeled on the free bingo games. Every Monday night at 9PM, Rehab Bingo is giving away £1,000 in free bingo games. There are 10 x £100 prize pot games to play in an hour, making it even more worthwhile for players to take part in free bingo games. Penny bingo is widely popular among players at Rehab Bingo. There are guaranteed cash prizes of £4, £6 and £7 when you lay out the pennies. The site also has a lovely loyalty program where players can enjoy lucrative benefits such as weekly cashback, weekly free bingo party, and so much more. Rehab Bingo also offers a Refer-a-Friend bonus of £15 simply for spreading the love of Rehab Bingo! Players at Rehab Bingo don’t have to worry about security breaches or lack of data protection because the site uses safe and secure software to ensure that every player’s personal and financial details are fully-protected. The site uses the latest encryption technology and the systems undergo extensive quality control checks by internal and external auditors. Rehab Bingo is regulated and licensed in Alderney. Playing bingo is enjoyable and fun, however playing bingo and making a difference to others’ lives is an exceptional merit that the RehabBingo site are renowned for. The Rehab Group is a major charity organisation that provide training, employment and many other services to those with disabilities in both the United Kingdom and Ireland. It’s a great feeling playing bingo online and helping others at the same time. By playing at Rehab Bingo, you’ll be helping to support more than 50,000 people with disabilities in more than 200 centres across England, Ireland and Scotland. But it’s not just about giving, it’s also about winning, and with Rehab paying out over £1,000,000 in prizes every month through special tournaments and competitions, Rehab is the best place to win big and give to charity at the same time! Rehab Bingo, the best of both Worlds! Why not join Rehab Bingo and players from all over Ireland & the UK! There are 8 bingo rooms to choose from, as well as a big selection of mini-games to enjoy too. Easy to Play, Easy to Win – Join in at Rehab Bingo Today!